Karida Clarke is a romance writer with a penchant for anything otherworldly. If it has scales, fur, poisoned talons, throws fire or casts magic spells, it might find its way into her stories. Karida likes her heroines multifaceted and her males swoon-worthy, Alpha-style. She believes that relationships matter more than things and places. In her free time, Karida enjoys lacing up for long runs and cooking ethnic cuisine. Pet peeves include Saran Wrap and people who don’t put their shopping carts away. Karida has an M.A. in English Literature, is a former college English instructor, and currently writes for a small newspaper. She lives with her nerd-tastic husband and two spunky kids in Ohio. Learn more about Karida and her books at karidaclarke.com. Kim: Ohio! What is your favorite sight, sound, and smell of the Buckeye State? Karida: I grew up in the military and then served in the military, so I have lived in multiple states and countries. When my husband's job moved us here, I was skeptical that I would like it. Ohio has been an amazing surprise for me and my family. We love it here so much that we've decided to put down some roots and stay a while. Ohio is a beautiful, affordable state with four seasons, tons of activities and cultural opportunities, and a low cost of living. I love watching the leaves change colors in the fall and that I can go hiking across creeks with my kids during the day and then go watch a Broadway play with my husband in the evening. Truly, we have the best of both worlds here. Kim: Cooking ethnic cuisine - what is your favorite recipe? What is your favorite restaurant? Karida: I eat gluten-free, so ethnic cuisine is wonderful since other countries don't rely on wheat as much as the U.S. My favorite cuisines are Indian and Ethiopian. My favorite restaurant is either Ajanta India Restaurant in Kettering, OH, or Lalibela Ethiopian Restaurant in Columbus, OH. No chain food--family restaurants with delicious food at good prices. As far as recipes, I love a good dal, a dish made from lentils and spices. Karida: So many people have helped me as I've pursued writing and self-publishing my novels. My sister most of all--she introduced me to the paranormal romance genre years ago. My husband, too--he puts up with my mood swings and he understands the creative process. Self-publishing was a decision I made so that the product I put out there is true to my vision. Every aspect of the book--from the picture and font on the cover to the names of characters and content of the epilogue--is as I intended it, so the reader is getting the experience I want for them. I am grateful for an editor, proofreader, and cover artist that gets me. Kim: Tell us about your books - what inspired them? Karida: I've published three books in my paranormal romance series, Phoenix Warriors, thus far. Paranormal romance is my favorite genre because it combines the fantasy of fairy tales with the heat and spice of a good romance. Rather than vampires and werewolves, which have been done well repeatedly, I chose to make my protagonists Phoenix because they are literally hot. Kim: What's next for Karida Clarke? Karida: The Phoenix Warrior series will contain six books. I've published three and am working on the fourth. Although all the books can be read as standalone novels, they contain the same characters, so you can learn tidbits about them by reading them in order. I am also in a writer's group that is putting together a modern fantasy anthology, so I hope to begin writing a short story for that soon. Mahalo, Karida, for serving and writing! 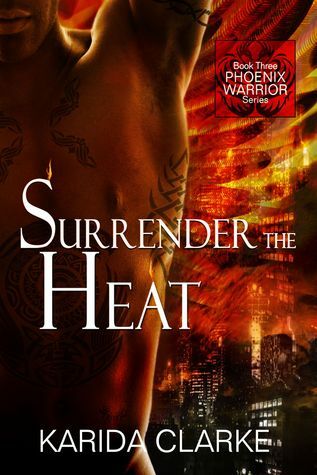 I am giving away a digital copy of CAPTURED HEAT, Book 1 in the Phoenix Warriors series, to one randomly selected commenter. 1. Leave a comment about Ohio - what do you know about the Buckeye State? 2. Comments are open through Saturday, July 24, 10 pm in Baltimore. 3. I'll post the winner on Sunday, July 25. I don't know anything about Ohio. Absolutely nadda :) I've never been. But it sounds a lot like where I live. Thanks for sharing and congrats to Karinda on the new release! Our favorite place in Ohio is Cedar Point - Roller coaster city of the world. It's a beautiful state and home of the buckeye candy. Nothing really! My husband has a couple of cousins that live there. I really don't know much about Ohio. Columbus is the capital and largest city in Ohio. I don't know too much about Ohio. I do have a friend who lived there for many years. He is a big Ohio State Buckeyes fan. We head to Ohio every September. Air Force friends retired there near Dayton. He is a blacksmith and when my husband and son took up the craft, we started attending the Southern Ohio Forge and Anvil (SOFA) Conference with them. It is an enjoyable event. This year in addition to the SOFA event, our AF group bi-annual reunion will be held in Dayton the beginning of September. The Air Force Museum at Wright-Patterson AFB is a great place to visit. The Wright Brothers place is open for visit and you can even schedule a flight in a reproduction of their plane. We haven't seen much of the rest of the state, but once we retire again, there is more we will explore. I know nothing about Ohio except where it is! I don't know a lot about it however I have driven through parts of the state a time or two. My daughter and her family recently moved to Ohio. Her hubby is a Sargent in the Army and is currently doing recruiting in Marietta, Ohio.